Seoul (Korea). 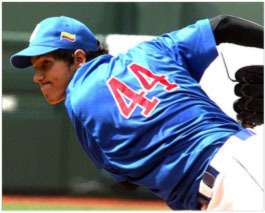 Astonishing Colombia got outstanding pitching from Roger Velez and José Cruz to defeat Japan 3-0 in the first game of the medal round at the 18U Baseball World Championship in Mokdong Stadium, Seoul. Episodes decided the game and the South Americans were perfectly on time to take advantage of the favorable opportunities. The Colombians went on the scoreboard in the second inning. Opened by Noriega with a basehit to the centerfield, Martinez sent him to second with a sac bunt, then a wild pitch and a throwing error by catcher Mori allowed him to get to the home plate for the first run. In the fifth, Morelos reached first on an error by second baseman Iyota, Liamas was walked by starter Shintaro Fujiami and both advanced on a wild pitch. Crisitan Cano hit safely to right and Noriega did the same, to finalize the score at 3-0. Team Japan put runners on third in both the seventh and eighth innings, but could not find the crucial hit to make them score.